Ubisoft have had a tough couple of years, it has to be said. Assassin’s Creed Unity was released broken (and remains broken even now) and Assassin’s Creed Syndicate bombed so badly that they decided not to make one this year, but plug the upcoming film instead. So E3 2016 was going to be very interesting for Ubisoft, which is when they dropped the bomb that is Watch Dogs 2. Watch Dogs was one of the first big releases scheduled for release day of the Xbox One and PS4 and when it debuted at E3, everybody was amazed by what they saw. The graphics were crisp and clear and the gameplay looked incredibly fluid. Everyone thought that the new age of gaming was upon us. But the game was delayed by Ubisoft and as a result fans couldn’t get their hands on one of the flag ship titles on release day. When it did eventually hit the shelves, the graphics were sub par and a far reach from what we were shown at E3 and the overall feel of the game was clunky and awkward. So it came as a surprise to many people when the trailer for Watch Dogs 2 was aired at E3. Instead of a lone vigilante hacking the city to gain some kind of justice, we are thrust into the boots of a young hacker called Marcus who is trying to join the ranks of Dedsec; a group of talented hackers. Their aim is to bring down the company CTOs by hacking their systems and exposing their flaws and weaknesses. For Dedsec to bring the plans to fruition, you must conduct a number of publicity stunts to gain followers on social networks, which will boost the downloads of the Dedsec app. The more downloads that the group receive, the stronger the CP power to hack the system. Some of these include driving a car from a famous in-game movie remotely around the city and exposing a religious sect for what they really are. Although I enjoyed the idea of the storyline, it quickly became tiring and the other characters associated with Dedsec started to become annoying and really got under my skin (one particular character was Wrench). 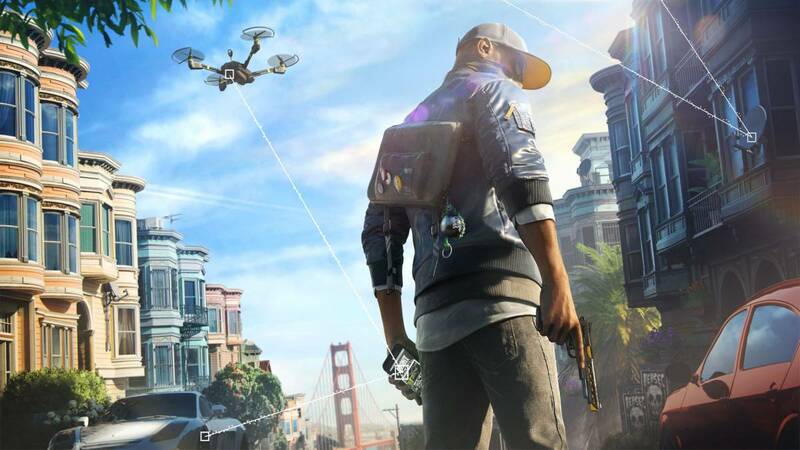 Where Watch Dogs tried to take itself too seriously, Watch Dogs 2 tries to make the game fun and the characters more interesting, but I feel it failed to do that. One of the biggest draws of the first game was the fact you could hack almost anything in the game world to suit your style of play. This includes bank accounts, read messages, computers and even traffic lights could be controlled so you could make the clean get away. Watch Dogs 2 sticks to the same formula but the hacking has become a little more complex. Instead of walking the streets and hacking with the press of a button, you must now physically enter the system and hack from there. This tends to be a little tiresome and, to be honest, downright annoying because when you’re being chased by the police, this is the last thing you want to do. Players will be pleased to know that the terrible driving mechanic of the first game has been fixed and the game really does look amazing. Everything has been covered from the graphics on the NPC’s that roam the streets to the little details in the main characters clothing, such as badges and buckles. The game world also looks amazing with a number of fantastic views for the player to find as they venture into the outskirts of San Francisco. But to do this, they have sacrificed the free running mechanic, forcing the player to press a button instead of just sprinting through the city. For someone like me who can’t multi-task for a sandwich, this sometimes became a hindrance. Watch Dogs 2 also offers a wide scope for players to customise their character in anyway they choose from dressing like a biker or for the more sophisticated player, a waistcoat and blazer. There is also DLC available to customise your character further, but this is very pricey and in my opinion, not really worth it. For those that tire of the missions (and you will, fast), there are a variety of side quests and activities you can take part in. You can race battery powered go-karts, take selfies with landmarks (which will sometimes get ‘photo bombed’ by the NPC’s, ‘check in’ to locations around the city which provide greater rewards for every milestone you hit and you can also take part in optional quests given to you by the members of Dedsec, which will increase your followers. Although the foundation of Watch Dogs is a good one, some gamers will find it a heavy slog. Money is harder to come by and the choice of cars at the beginning of the game is limited, in till you can afford to purchase them from the showrooms. Upgrading your abilities has also increased in difficulty as you must reach a certain number of followers to gain upgrade points. There are some lying about the city but trying to get them is a chore in itself, with some of them being intricate puzzles which just take far too long. It is also worth a mention that when I was playing, the multiplayer aspect of the game was so broken it was appalling. But some of the online missions include bounty hunting (which can be a laugh) and a game of virtual tag. I enjoyed Watch Dogs 2 for what it was – a bit of fun. But for the completionists out there, you are going to find this game is a slog. I would highly recommend playing this as a side game instead of chucking straight hours into it.